sometimes written as "Chiengmai" or "Chiangmai", is the largest and most culturally significant city in northern Thailand, and is the capital of Chiang Mai Province. 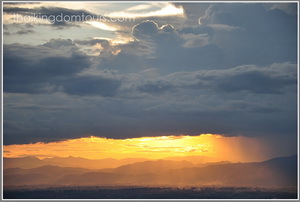 It is located 700 km (435 mi) north of Bangkok, among the highest mountains in the country. The city is on the Ping river, a major tributary of the Chao Phraya river. handcrafted goods, umbrellas, jewelry (particularly silver) and woodcarving. King Mengrai founded the city of Chiang Mai (meaning "new city") in 1296, and it succeeded Chiang Rai as capital of the Lanna kingdom (meaning the kingdom of million rice field). The ruler was known as the Chao. The city was surrounded by a moat and a defensive wall, since nearby Burma was a constant threat. 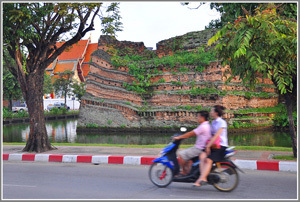 With the decline of the Lanna kingdom, the city lost importance and was often occupied either by the Burmese or Thais from Ayutthaya. Because of the Burmese wars that culminated in the fall of Ayutthaya in April 1767, Chiang Mai was abandoned between 1776 and 1791. Lampang then served as the capital of what remained of Lannathai. Chiang Mai formally became part of Siam in 1774 by an agreement with Chao Kavila, after the Thai King Taksin helped drive out the Burmese. 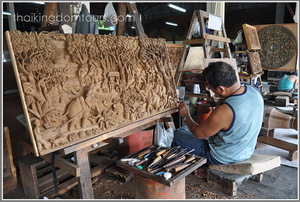 Chiang Mai then slowly grew in cultural, trading and economic importance to its current status as the unofficial capital of northern Thailand, second in importance only to Bangkok. The inhabitants speak Kham Muang (also known as Northern Thai or Lanna) among themselves, though Central Thai is used in education and is understood by everyone. English is used in hotels and travel-related businesses and many educated people speak English. The Kham Muang alphabet is now studied only by scholars, and Northern Thai is commonly written with the standard Thai alphabet. 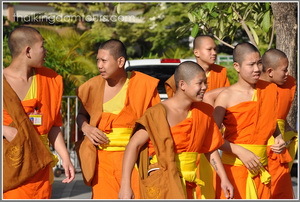 The people of the Chiang Mai refer to themselves as the Khon Muang, and are of mixed origin. The first inhabitants were known as the Lawa. These people were joined by other groups moving along the trading routes of the river valleys. Notable amongst these were the Mon, who originated from the region around Thaton in Burma. The Mon founded Haripunchai, a northern offshoot of the Dvaravati civilization that predominated in the Chao Phraya basin from the 6th - 10th centuries. By the 13th century, however, the dominant group were ethnic Tai, who had been migrating south into the valleys from at least the 10th century (some theories plausibly suggest the Tai may have been in the area long before this date). This group came to be known as the Tai Yuan. Until the European colonialism of the 19th century, the politics of the north was dominated by the struggles with the Burmese, and between the kingdoms of Ayutthaya, Lanna and Lan Xang. Each military incursion involved forced relocation of populations to increase manpower. Thus the wars of the region served mainly to mix ethnic Tai groups. Such resettlements tended to be geographically based, resulting in subtle differences within the population of the valley to this day. coming overland from Yunnan. Many of the latter were Muslims who had fled to the hills after the brutal Chinese suppression of the Panthay rebellion in Yunnan in 1873. At the same time the hill-tribes were also moving south through the uplands. In the mid 19th century Westerners started arriving with Christian missionaries and increased in numbers with the growth of the teak industry. The teak industry also attracted large numbers of Shan who worked all over the north for the logging companies. 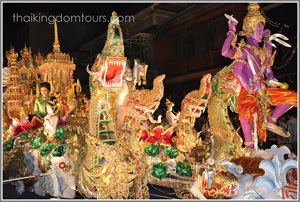 Chiang Mai is blessed with festivals almost the whole year round. Old festivals are based on the lunar calendar and either have their origin in Buddhist or Brahmanic traditions or Tai beliefs. Newer festivals have evolved from a blend of local traditions and commercial interests. These are some of the main festivals in Chiang Mai. Flowers in Chiang Mai are at their best before the end of the cool season when this festival is held. This falls on the first weekend of February. The center of the festival is the parade held in the morning of Saturday. Floats decorated with flowers illustrate the theme chosen. The beauty queens surrounded by flowers make a magical sight. The flower beds of the public gardens are bathed in color and special displays are maintained till the end of Sunday when the most beautiful float will get a prize at a competition held at the Suan Buak Hat Park. Previously the parade was held on the outer moat road from Katam Corner to Sri Phum Corner. Recently this has changed to a route from the Nawarat bridge along Thapae Road to the Suan Buak Hat Park. This festival marks the traditional Thai New Year, which until 1940 used to be when the Siamese new year began. The festival is the most important and is traditionally held when the sun moves out of Pisces. In Chiang Mai the main events take place over three days (the dates vary for other northern provinces). By custom the first day falls on April 13th and is the last day of the old year. Firecrackers are let off at dawn and people spring clean their houses. 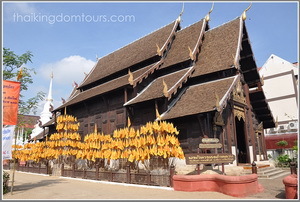 In the afternoon a parade of Buddha images from Chiang Mai temples goes from the railway station to Wat Phra Singh. Northern people toss lustral water (water scented with perfume and flowers) to bathe the images as they pass along the streets. The Phra Sihing image leads the procession to Wat Phra Singh, where it is set in front of the temple for citizens to bathe throughout the rest of the festival. Ceremonies are not held on the second day, which separates the new year from the old. In the afternoon sand is placed in the temple compound as a symbolic return of the sand carried out on the soles of shoes and feet of the people. The sand is made into small stupas for the next day. The New Year begins on the third day. The early morning is a particularly good time to visit the temples to watch people in traditional costume bringing offerings. Ceremonies are held in the viharn. Outside, the people place flags in the sand chedi as well as symbolic sticks of support under Bhodi trees to bring good fortune in the New Year. Later in the day juniors pay respect to senior people and family members in a ceremony known as tam hua. In the afternoon the main government organizations hold a procession from Yupparat School to honor the governor at his residence by the Nawarat Bridge. 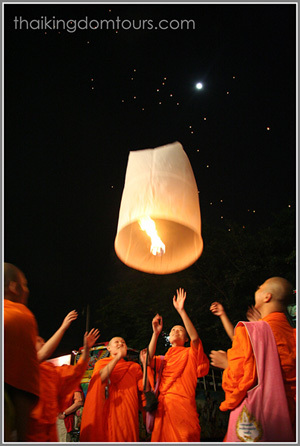 Loi Kratong, which is also known as Yi Peng in the north, is the most colorful festival of the year. It takes place over three days of the full moon of the twelfth lunar month, which is usually in November. The festival may have evolved from Brahmanic rites to honor the dead as well as local rites to bring an end to the rains. Though legends suggest it was established by the time of King Tilokarat in the late 15th century, the origins of this festival prior to the 19th century are uncertain. Now people generally believe that by releasing floats and balloons they get rid of bad luck and give thanks to the water and heavenly elements. 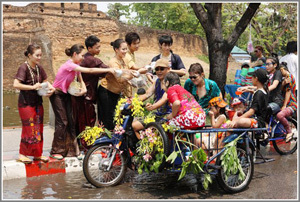 Older folks may say that it is to show gratitude to the Goddess of the River - Mae Khong Kha - for use of the water. For the three nights of the festival people release small floats - Kratong - made of disks cut from the banana tree stem and banana leafs, with offerings that include incense, flowers, candles and money into the rivers and lakes. The Ping River becomes a stream of lights floating gently with the current. Small hot air balloons rise like lanterns high into the sky, complementing the floats drifting on the waters. Fireworks are let of everywhere, particularly on the banks of the Ping River, and there is a parade each night in Chiang Mai. The festival begins the day before the full moon. People decorate the entrances of their houses with coconut branches, banana leafs, sugar-cane lanterns and colored paper. As dusk falls people light earthen lamps placed along the walls of their property and the fireworks start. The lantern parade takes place on Wang Sing Kham Road between Nawarat Bridge and Nakhorn Ping Bridge. On the morning of the day of the full moon, people present offerings at the temples before releasing large hot air balloons from temple grounds. A competition for the best balloon is held in front of Chiang Mai Hall on Wang Sing Kham Road. Boat races are held on the river. 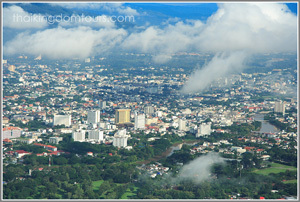 Chiang Mai enjoys a cooler climate than other areas in Thailand and a holiday here can be enjoyed all year round. While it does experience a hot season, this is still somewhat milder than in Bangkok and certainly less humid. Like elsewhere in Thailand, the north sees three distinct seasons: the hot season, the rainy season and the cool season. less crowds and therefore cheaper prices. There are also occasional thunder storms during this period, although they can actually be a welcomed relief. Rainy season arrives in mid May and lasts until the end of October. The countryside once again becomes lush and trees and flowers bloom. Despite its name, it does not rain every day and often showers are short and refreshing. There can of course be longer spells of rain which cool things right down. If you decide to visit during this time, don't forget to pack an umbrella and some waterproofs if you are going trekking. Flooding can be a problem in the city as the Ping River reaches bursting point, but bad floods are rare and mild flooding is usually cleared up quickly. If you're not keen on rain and don't particularly want to roast in the basking sun of the hot season, the cool season (November to February) is the time to come. This is Chiang Mai's peak season and the city welcomes not only a rush of overseas tourists, but also many Thai tourists escaping Bangkok. There is little or no rain during this period and blue skies are guaranteed. It is the perfect climate for sightseeing, sunbathing or trekking with temperatures dropping to the mid 20's°C. Evenings can get a little chilly, so a light jacket or jumper is recommended. shopper, the Chiang Mai night market features numerous street stalls and shops, the Sunday Market offers more unique, independently created souvenirs and products, and the indoor, air conditioned Central Airport Plaza shopping complex near Chiang Mai Airport sells international brand name products. 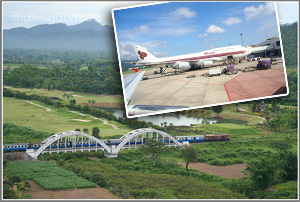 As a gateway to northern Thailand, Chiang Mai is easily accessible by air, rail and bus. Several domestic and international airlines have direct flights to Chiang Mai International Airport, including low-cost carriers, such as Nok Air, Air Asia and One-to-Go. 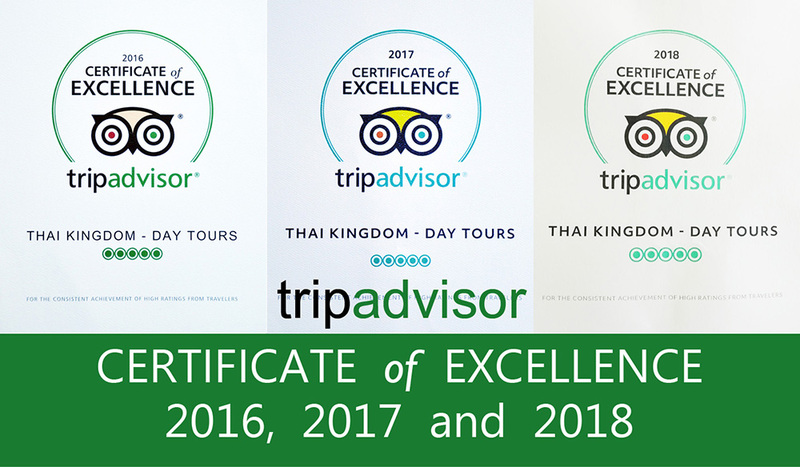 Travelling by train is also convenient, with a range of options from overnight sleeper trains to express trains, which depart from Bangkok's Hua Lamphong Station around the clock. The slowest but also the cheapest, buses can be an ideal transport mode for the more adventurous soul, as the quality of your journey lays pretty much in the hands and whim of the unpredictable driver. Read Cap or Songthaew ,literally means 2 rows in Thai, is actually a covered pick-up truck fixed with 2 rows of benches. It is a kind of shared taxi and the main mean of public transport for Chiang Mai commuters. The norm is wave your hand if you see them along the road, it will stop and you have to ask the driver if it will pass along your destination or not. If not try another one. Tuk-tuks are quick, though it is a noisy way to get around. Fares are usually 50-60 baht for a short hop and 70-100B for longer distances, depending on the proficiency your haggling skills. Chiang Mai has some metered taxis, though it can be difficult to persuade the driver to switch the meter on. Most of them are available at Chiang Mai Airport. Sam Lor (meaning three wheels) or Rickshaw-You will find Sam Lor or Rickshaw in some areas of Chiang Mai particularly around the Chiang Mai Gate,Warorot and Somphet Markets, they are absolutely perfect if you just want a leisure ride around to enjoy the beauty of the old city. Expected to pay 30-40 baht for a short ride around the town.